Today I visited Siem Reap (northwest Cambodia, adjacent to Thailand) along with Family Care Cambodia rep’s, during which time we also passed by the nearby historic ruins of Anghor Wat. 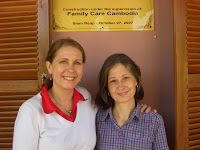 Our main reason though was to tour a school renovated this past year by Family Care Cambodia, which included the addition of a building housing 3 classrooms, a computer lab and bathroom facilities suitable for the 1200 students in attendance. To illustrate the vast educational needs of the children and teachers in the area, allow me to share an anecdote from our meeting with the provincial head of the Dept of Education. This dear fellow, who was a visionary amongst his peers despite his years of internment under the Khmer Rouge, told us frankly he had never even heard of computers until 1997! And he then went on to say he had then not had the opportunity to use one until the year 2000!